The new Bishop Street bakery sets up shop in a Victorian bungalow. 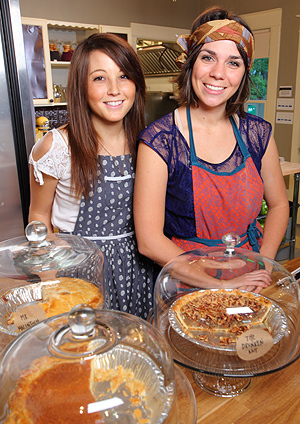 Emporium Pies is located at 314 North Bishop in Oak Cliff—as in 3.14, the decimal approximation of the number pi. Owners Megan Wilkes and Mary Sparks acknowledge the happy, nerdy coincidence with a π symbol in the brick pattern out front, the final step of a three-and-a-half-month renovation overseen by Wilkes (a former interior designer and project manager for construction companies). But it’s a perfect location for a pie shop regardless of address. The 1930s Victorian bungalow, redone in bright colors and restored wood paneling, is surrounded by foodie favorites such as Lucia, Eno’s, Oddfellows, and Boulevardier, smack in the heart of an area that appreciates Wilkes and Sparks’ artisanal approach, with flavors like Drunken Nut (bourbon pecan) and the Smooth Operator (chocolate with a pretzel crust).